We’d love your help. Let us know what’s wrong with this preview of Stephen Hawking by Mª Isabel Sánchez Vegara. To ask other readers questions about Stephen Hawking, please sign up. 'They all ate dinner with a knife, a fork, and the company of a good book'. 'No matter how difficult life may seem, there is always something you can do and succeed at'. ‘Little people, big dreams’ is bound to become my next favourite series. I loved the quirky style of the illustrations- so colourful and engaging. The high quality of artwork is matched by the informative and entertaining text, simple and accessible even to a very young child. I c 'They all ate dinner with a knife, a fork, and the company of a good book'. ‘Little people, big dreams’ is bound to become my next favourite series. I loved the quirky style of the illustrations- so colourful and engaging. The high quality of artwork is matched by the informative and entertaining text, simple and accessible even to a very young child. I can easily see this inspiring book being read aloud by parents as well as being used in class as a springboard for discussion on the true meaning of success in life. Thank you NetGalley and Quarto Publishing Group for the privilege of reading and reviewing a copy of this wonderful book. Manybooks Hilary wrote: "The ones with enjoyable illustrations are definitely in the minority. I have yet to read the Jane Goodhall!" You should definitely try t Hilary wrote: "The ones with enjoyable illustrations are definitely in the minority. I have yet to read the Jane Goodhall!" I know quite a lot about Stephen Hawking's life but it is always inspiring to read about his achievements considering that most of them happened when his illness had already started ta The ARC of this book was provided by the publisher via NetGalley in exchange for an honest review. Another great addition to Little People, Big Dreams. I always like that the include a short, extended bio at the end. It’s nice for the adults and older children who may read this to their toddlers. Maria Isabel Sánchez Vegara's introduction to famed British astro-physicist Stephen Hawking is one of the rare positive instalments I have so far encountered in the Little People, Big Dreams series. Presenting a simple but still more than detailed enough portrait of Stephen Hawking's life (from his childhood in Oxford to his stellar university career which even his diagnosis of amyotrophic lateral sclerosis could not hamper and destroy), Stephen Hawking is sufficiently informative to present an Maria Isabel Sánchez Vegara's introduction to famed British astro-physicist Stephen Hawking is one of the rare positive instalments I have so far encountered in the Little People, Big Dreams series. Presenting a simple but still more than detailed enough portrait of Stephen Hawking's life (from his childhood in Oxford to his stellar university career which even his diagnosis of amyotrophic lateral sclerosis could not hamper and destroy), Stephen Hawking is sufficiently informative to present an extensive biographical narrative of both Stephen Hawking as a family man and as an astro-physicist of talent and renown, as the individual who penned the world-famous A Brief History of Time and yet still simple enough to be enjoyed and appreciated by the intended audience, by the so-called picture book crowd (and indeed, the only and very mild criticism I do have regarding Maria Isabel Sánchez Vegara's text is that I really do not understand why in Stephen Hawking, the book that made Hawking famous, his above mentioned A Brief History of Time, is not referred to by title within the narrative itself, is simply called a book that "helped the world understand the meaning of the universe"). The book covers the major details of his life from birth, a childhood where he struggled in school and yet excelled in questioning and discovering, to his life in university, including the onset of the disease that would so impact his physicality and great discoveries he made. At the conclusion of the story is a slightly more detailed bio I have heard great things about the Little People, Big Dreams series, so I was eager to read this instalment which features the great scientist Stephen Hawking. The book covers the major details of his life from birth, a childhood where he struggled in school and yet excelled in questioning and discovering, to his life in university, including the onset of the disease that would so impact his physicality and great discoveries he made. At the conclusion of the story is a slightly more detailed biography, a well as suggestions for further reading. While this story includes enough details to be adequate for young readers foraging into research it is a pleasant story to simply read and enjoy, all the while learning about the great man. The language used is simple and the storytelling straightforward. The digitally created illustrations are bright and eye catching, bringing the characters to life. Stephen Hawking is a great addition to the Little People, Big Dreams collection. I've seen books from this series pop up from time to time on my Goodreads feed, but I'd never tried one before. This particular book is about the British physicist Stephen Hawking. As a biography aimed at kids, it's pretty good. I didn't learn anything I hadn't known before (since I've seen The Theory of Everything, the biopic based on the memoir by his wife) but the book laid out his life and accomplishments in a nice, easy-to-understand format. There's a timeline in the back that offers a littl I've seen books from this series pop up from time to time on my Goodreads feed, but I'd never tried one before. This particular book is about the British physicist Stephen Hawking. As a biography aimed at kids, it's pretty good. I didn't learn anything I hadn't known before (since I've seen The Theory of Everything, the biopic based on the memoir by his wife) but the book laid out his life and accomplishments in a nice, easy-to-understand format. There's a timeline in the back that offers a little more biographical information about the man and his disease (referred to only as ALS; this is a children's book, after all). Hawking had so many accomplishments that it must've been difficult to decide what to focus on. This book mainly talks about his discovery of Hawking radiation and glosses over most of the rest of the things he did. I suppose this book is a good place to start for kids who don't know anything at all about the physicist. Luckily, there are some books listed at the end for additional reading, which is a nice touch. If this volume is indicative of the quality of simple, kid-oriented biographies in the rest of the series, then I hope to read some more of them in the future. Manybooks La Coccinelle wrote: "Manybooks wrote: "Too bad that this is really a rather rare gem in my opinion." I'm still hoping to read another book in the seri La Coccinelle wrote: "Manybooks wrote: "Too bad that this is really a rather rare gem in my opinion." I'm still hoping to read another book in the series that's as good as this one!" La Coccinelle I'll have to see if I can find those. Thanks! The Little People, Big Dreams children's series is primarily full of famous women from history. However there are a few noted men included; and instead of being Presidents or your average successful white male they chose some people that I think are more inspiring for children. In this edition we get Stephen Hawking. Hawking is a man I have untold respect for. To live your life with virtually no ability to do anything yourself and yet still be able to show others that you have abnormally high in The Little People, Big Dreams children's series is primarily full of famous women from history. However there are a few noted men included; and instead of being Presidents or your average successful white male they chose some people that I think are more inspiring for children. In this edition we get Stephen Hawking. Hawking is a man I have untold respect for. To live your life with virtually no ability to do anything yourself and yet still be able to show others that you have abnormally high intelligence is difficult. Most people would see Hawking (if they didn't know him) and immediately dismiss him because of his inability to physically move. He sure proves them all wrong! I really like how these books are easy to follow. Good starter reading for kids. A Grade 1 student learning to read, for example, could learn new words and discover a new hero from them. Isabel Sanchez Vegara has done a good job of taking a lot of complex moments in Hawking's life and bringing them down to a child's level. My hope is that kids will read this book and want to become scientists or at least learn that the universe and space are mysterious and worth studying. Really love these little collections! The ‘Little People, Big Dreams’ series provides informative and inspirational biographies about people who left a mark on this earth, no matter what difficulties they have encountered. “Instea The ARC of this book was provided by the publisher via NetGalley in exchange for an honest review. “Instead of looking down at his feet, Stephen decided to look up at the stars”. This little short book about Stephen Hawking is a sight for sore eyes. The illustrations are very beautiful, and they enhance the text. This is a wonderful children’s book on Stephen Hawking’s life. It gives you a glimpse into his childhood before he was diagnosed with a debilitating disease and shows readers how he continued to look to the stars even when he wasn’t given much time to live. This is an easy to read little children’s book. I plan to have my homeschooler read it tomorrow and hope to track down the entire series, I just love it! Thank you to NetGalley and Quarto for this e-copy, my opinions are my own. There was absolutely no doubt in my mind that I would be requesting Stephen Hawking by Isabel Sanchez Vegara and illustrates by Matt Hurst the second that I first saw it. I've always loved the man and the contributions he made for science and so to see how he's being introduced to and talked about among the kids of this generation is something I'm definitely interested in. And I'm really glad to have gotten the chance to read this one. Of late, I've seen a number of books out there introducing c There was absolutely no doubt in my mind that I would be requesting Stephen Hawking by Isabel Sanchez Vegara and illustrates by Matt Hurst the second that I first saw it. I've always loved the man and the contributions he made for science and so to see how he's being introduced to and talked about among the kids of this generation is something I'm definitely interested in. And I'm really glad to have gotten the chance to read this one. Of late, I've seen a number of books out there introducing children to the most important figures of scientific history and it's been such a wonderful thing to see. So much so that I even bought one of them for my niece on her birthday. I didn't love the artwork in this book, but it was well done and will certainly go a long way in keeping children engaged in the story that's being told. I appreciated the way Hawking was represented and the colors used. Color is one of the most important things in artwork found in children's books, after all, for that is what's going to keep their eyes on the page. All in all, the story the book tells is a good one. It goes over the life of Stephen Hawking, discussing his illness as well as his amazing and profound achievements. I loved that the book included his family, though I do think they painted it in a light that glossed over a lot of the truth behind his familial life. I notice this a lot in kids books and I know many people seem to think that children aren't ready for such truths, but at the same time I feel as though it's unnecessary to hide everything. Stephen Hawking was definitely a good start and introduction for kids into this amazing man and I would definitely suggest checking it out. I adore this series of books and Stephen Hawking is no exception. This tells the story of his life, his health, his sheer determination and his science in such a charming way with beautiful naive illustrations. Children and adults alike will love the rhythm of the story and will learn something too. I love this series. Every single book that I have read and reviewed from it is inspirational, information and perfect for that targeted age group. I love to highlight them whenever I can because I want to encourage you to have a collection of these stellar books. Stephen Hawking was born in Oxford to a very eccentric and intellectual family. " His parents loved science, as did Stephen and his three siblings. They all ate dinner with a knife, a fork, and the company of a good book." When he was I love this series. Every single book that I have read and reviewed from it is inspirational, information and perfect for that targeted age group. I love to highlight them whenever I can because I want to encourage you to have a collection of these stellar books. When he was a wee boy he used to stare out his bedroom window up at the stars and ponder the universe's magnitude and hidden mysteries. Although Stephen was not the smartest in his class his peers dubbed him "Einstein". Why one day he built a computer from clock parts and an old telephone as his assigned science project. He put curiosity ahead of his daily school work and his mind was always buzzing with possibilities. He attended Oxford and Cambridge Universities and he longed to solve the mysteries of the universe. Unfortunately he was diagnosed with a paralyzing illness and his whole world drastically changed. He came to terms with his physical ailment and was determined to use his mind to reach heights that had never been reached before. He worked hard, studied hard, got married and fathered three children. He lost his voice, but that did not deter his pressing on and with a new robotic one he dictated books and interactived vigorously with the scientific world. He went on to make one of the biggest scientific discoveries of the 20th century: Hawking radiation. He was an inspiration to humanity on so many levels. This board book contains high quality illustrations that are colourful and engaging. They enrich the text for young readers to get a visual understanding of Stephen Hawking's life and achievements. The author has included a more thorough biography and timeline of Stephen's life at the end of the book. "No matter how difficult life may seem there is always something you can do and succeed at." Stephen Hawking is a new biography for young readers in the Little People, Big Dreams series. I've reviewed a number of these titles and I'm always impressed and enchanted by how much detail they manage to include in these little books in an age-appropriate and accessible manner. Released 7th Feb 2019 by Quarto on their Frances Lincoln imprint, it's 32 pages and available in hardcover, and ebook formats. Written by Isabel Sánchez Vegara it's well wri Originally published on my blog: Nonstop Reader. Written by Isabel Sánchez Vegara it's well written in clear accessible language. I really loved the illustration (p. 4) of the whole family with Stephen and siblings reading at the dinner table and talking. The art by Matt Hunt is appealing and colorful and supports the text very well. The illustrations are rich in small subtle details which bear a closer look. I like that his neurological health issues were mentioned, but not dwelt on, and that they mentioned his relatively normal family life (he married, had 3 kids and a wife). Well written and appealing, I am really enjoying all of these little books. This one is a worthy addition. Stephen Hawking’s life was truly amazing and this Little People, Big Dreams biography opens up his life and scientific endeavours to a younger generation. Vagara presents the key facts, milestones, accomplishments and personal struggles in an enjoyable and relatable style. ‘Children are sponges absorbing the world around them,’ is her impetus for writing these biographies. Hawking’s life is pleasingly portrayed by Matt Hunt’s crisp, linear digital illustrations where dark skies shimmer with star Stephen Hawking’s life was truly amazing and this Little People, Big Dreams biography opens up his life and scientific endeavours to a younger generation. Vagara presents the key facts, milestones, accomplishments and personal struggles in an enjoyable and relatable style. ‘Children are sponges absorbing the world around them,’ is her impetus for writing these biographies. Hawking’s life is pleasingly portrayed by Matt Hunt’s crisp, linear digital illustrations where dark skies shimmer with stars, dark and lighter tones shape the setting and simple stylised characters show stages of life. Young Stephen was born during World Ward II in Oxford England to a family who loved science and encouraged education. His nickname at school was Einstein, he even built a computer from clock workings and an old telephone. His passion was studying the universe and he studied Cosmology at Oxford University. When diagnosed with ALS, a neuro-degenerative disease he determined to study the stars rather than be limited by his condition. Vagara presents this information with a simplicity suited to younger readers. Four and a half neutron stars. This is part of a series that has survived for years now without introducing its young readers to any male people of note. Now, two men have encroached – Muhammad Ali and Stephen Hawking. It's a perfectly reasonable primer to the man, with the script barely featuring more than two sentences per spread. The simplifying of things does make a little of the text at the level of platitudes ("Instead of looking down at his feet, Stephen decided to look up at the stars. Ma Four and a half neutron stars. The Little People, Big Dreams series shares the lives of extraordinary people through adorable, quirky illustrations and simple language. Each person represented has had an incredible impact on the world, but started life as a child with a dream. "Instead of looking down at his feet, Stephen decided to look up at the stars." This brilliant and moving addition to the Little People, Big Dreams series tells the fascinating and remarkable story of Stephen Hawking. Recounting his early days in school i The Little People, Big Dreams series shares the lives of extraordinary people through adorable, quirky illustrations and simple language. Each person represented has had an incredible impact on the world, but started life as a child with a dream. This brilliant and moving addition to the Little People, Big Dreams series tells the fascinating and remarkable story of Stephen Hawking. Recounting his early days in school in Oxford, England, to his diagnosis while at university, it details his study of physics and the universe, particularly Black Hole theory. This book, although simple, evokes the message that determination and resilience are some of the most important tools one can use in achieving one's dreams. I'm a fan 'Stephen Hawking' by Mª Isabel Sánchez Vegara with illustrations by Matt Hunt is a board book in the Little People, Big Dreams series of board books for little readers. This short story is inspirational for children growing up. Despite Stephen's early diagnosis of ALS, he threw himself into his studies, determined not to be defined or restricted by his illness.He wasn't the smartest student, but his curiosities and hard work were enough for him to solve mysteries in the world. This is a brilliant message for children (and adults) about never giving up on your dreams. The illustrations complement the story well and are great for engaging the reader. It is a book I will definitely read with my child in the future. Part of the Little People, Big Dreams series, here comes another wonderful addition: the life of Stephen Hawking, simplified enough for children to understand and yet magical enough to inspire! This is the life of one of 21st century's greatest minds laid out in simple, yet smart storytelling. Accompanied by beautiful illustrations, this is the perfect way to help children get familiar with Hawking I voluntarily read and reviewed an advanced copy of this book. All thoughts and opinions are my own. This is the life of one of 21st century's greatest minds laid out in simple, yet smart storytelling. 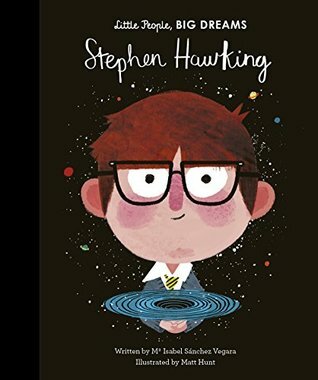 Accompanied by beautiful illustrations, this is the perfect way to help children get familiar with Hawking's life and works. Stephen Hawking's story is the first one of the Little People & Big Dreams series that I've ever read. The illustrations are absolutely darling. I kept flickering back to the pages because they were drawn so wonderfully quirky and adorable. As an adult, the given information was known to me, and I think they were explained easily enough for children to grasp an idea of what Mr. Hawking did. The timeline at the end was very informative as well. What a splendid little book! Absolutely charming Stephen Hawking's story is the first one of the Little People & Big Dreams series that I've ever read. The illustrations are absolutely darling. I kept flickering back to the pages because they were drawn so wonderfully quirky and adorable. As an adult, the given information was known to me, and I think they were explained easily enough for children to grasp an idea of what Mr. Hawking did. The timeline at the end was very informative as well. What a splendid little book! Absolutely charming! How lovely that there's this sweet little book in remembrance of Stephen Hawking now. One that doesn't leave out the sad parts of this true story and, despite that, manages to deliver a message of pure positivity. And very easy to follow even for kids, I believe. Probably one of my favourites from the series! *I received a digital copy through netgalley.com in exchange for an honest review. I love this book that present important person with short story/biography and I had huge respect for Stephen Hawking and what he achieves has a person and as a scientist. In our modern world there is a big need to show kids great person that achieve things and were not just popular or known because they post picture on Instagram and this book des that very well. Great job!! Amazing book. I love the way it was illustrated. Just Beautiful. Would recommend it to any kids. Thank you for the arc NetGalley. Maria Isabel Sánchez Vegara, born in Barcelona, Spain, is a writer and creative director perhaps best known as the author of much of the Little People, Big Dreams series. Each book tells the childhood story of one of the world's female icons in an entertaining, conversational way that works well for the youngest nonfiction readers, allowing them to identify with the characters in each story.